Eddie was our first American Import brought in from the Dogwood Hollow Kennels in the USA. He was imported largely due to his stunning pedigree and because he was a Liver/White Dog. 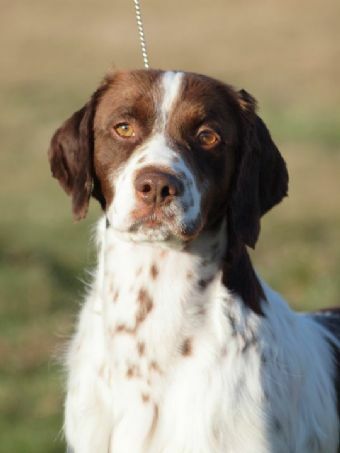 Shown by our son Jake, Eddie earned his title the hard way having to compete against all of our dogs including Spinner. Despite this he did indeed title with a Best of Breed win over Spinner in Canberra finishing him off. Along the way Jake learnt a lot about handling and even won a Runner up in Group in Lithgow with him. Eddie retired as soon as he titled and has moved to live with a family in Melbourne where he lives the life of luxury on the couch. We didn't end up using him at stud often as he wasn't quite what we where hoping for with conformation. He did however have a beautiful gentle nature and it was fun having him around while we did.